Words of inspiration are beautifully inscribed on this Memorial Keepsake. Honor someone you love who has passed with this Personalized Memorial Tear Drop that helps the memory of their lives live on forever. 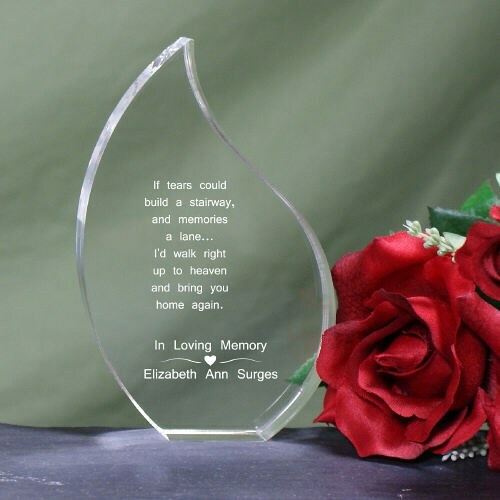 This Engraved “If Tears Could Build A Stairway” Memorial Keepsake is featured on our clear Tear Keepsake that measures 5” tall with edges measuring .75” thick. Free personalization of any name is included on this memorial keepsake. If tears could build a stairway and memories a lane... I'd walk right up to heaven and bring you home again. The perfect little memorial keepsake for a young boy who lost his best 4 legged friend. Additional Info Commemorate the life of a special loved one who has passed and honor them with our Memorial Gifts and Keepsakes. Our memorial keepsakes give comfort to those who need it the most and make treasured gifts that last a lifetime.